The Cherry Basket Farm wedding of Marissa & Chris was so fun! We loved working with the couple and getting to know them throughout the planning process. It was a perfect day, from the weather to all the pretty details to the ripe tart cherries on the trees in the neighboring orchard. Their desire to host a sweet party with delicious food was at the heart of our planning strategy. Chris and Marissa moved to Traverse City right after their wedding, so I celebrate the fact that we are now neighbors! We have kept in touch and have recently collaborated with Chris and his brother Nick on their new project called The Boardman Review. It is a print and online journal highlighting the stories of the people and businesses in Northern Michigan. Here is a link to our article, and to the accompanying short documentary. We were attracted by the reputation of the catering company; the location; the barn; and the grounds. Epicure Catering is renowned in Leelanau County, if not most of North West Michigan. We knew that we would not have ordinary “wedding food” from Epicure, and we were right! Many people told us how good the food was and that they considered it to be the best meal they had ever had at a wedding. The farm is located on a beautiful peninsula in Northern Michigan, and when we decided to choose Cherry Basket Farm as our wedding venue we became very excited when imagining our guest’s reactions when driving to the barn. We imagined them driving up the coast along M-22 on a perfectly sunny day, looking at the water, and weaving through cherry orchards and vineyards, and arriving at this beautiful historic barn tucked away in the woods, and we knew that we wanted to give our guests this memorable experience and make them feel special. Shabby Chic; rustic; and laid back. Although I (the bride) am detail oriented and organized I’m realistic when it comes to things that are out of my control. Fortunately for me, Cammie had everything under control and is very experienced, so I didn’t have to ‘handle’ any issues on our big day. 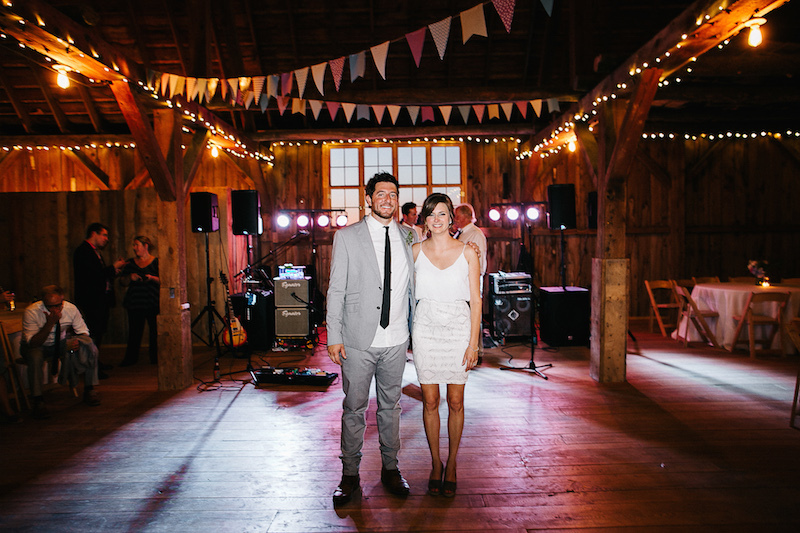 Maddie, our coordinator, was also very capable and proactive, so I didn’t have to even worry about going back to the farm the next day because she had already put everything that we needed in the best man’s car for us. We wanted our guests to feel like they were getting to experience a secret part of northern Michigan that is exclusive and rare! We wanted them to have a fun vacation with a really nice party thrown in!! We were nontraditional in that we didn’t have a seating chart for the reception, we didn’t have a receiving line, we didn’t do a lot of traditional ‘wedding’ things like garter/bouquet toss. We considered our wedding to be one of the best parties that we will ever throw in our lives, and we wanted our guests to feel relaxed and entertained. We accomplished that by giving them options and having games like giant connect four and corn-hole (bags) set up for them. We had a roaring fire in the fire pit that our guests roasted s’mores over. We didn’t limit our guests to eating and dancing only. They had areas of activities that allowed them to mingle, relax, and enjoy their time with us and each other. For us, the most important elements of our wedding day was our guests, the ceremony, the food, and the experience that we provided for our guests. Everything else was bonus. We really, really, lucked out with the weather on our wedding day. All of our vendors were amazing and helped to create our perfect day. Being surrounded by all of your family and friends is a rare and beautiful occasion that truly underlines how meaningful getting married is and what love really means. Prepare to pay more than you expected. I’ve heard from a few people that you should double your budget when going in to a wedding. Although we didn’t double our budget by any means, we did spend more than we expected. One friend jokingly said “nothing in a wedding costs less than $1,000!” and there were a few occasions that his words rang in our head during our planning process. Hire a coordinator!! After the wedding we realized that Maddie and her team were INVALUABLE to us. Our day would not have been as special and perfect and as easygoing as it was without her! If there is one thing that every couple should have it is a coordinator. All images courtesy of Dan Stewart Photography. For more images and vendor details, please visit Chris & Marissa’s gallery on our weddings page.